Pakistan's nuclear authority has said there is no cause for concern after it published press adverts for information on "lost" radioactive material. The adverts urged members of the public to inform officials if they found any "lost or stolen" radioactive material. They were published in major Urdu-language newspapers in Pakistan. A spokesman for the nuclear authority said that there was a "very remote chance" that nuclear materials imported 40-50 years ago were unaccounted for. International concern over the safety of Pakistan's nuclear programme was expressed in 2004, when the country's top nuclear scientist, AQ Khan, confessed to leaking secrets to Iran, North Korea and Libya. Dr Khan was subsequently placed under virtual house arrest, and is now suffering from pancreatic cancer. Officials on Wednesday were keen to reassure the outside world that the latest incident in no way has the makings of another nuclear scandal, and that no radioactive material had been stolen, lost or gone missing. 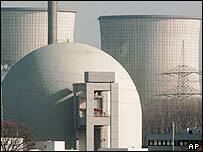 But officials say they need to heighten public awareness of nuclear issues to ensure that decades-old nuclear material is fully accounted for. "This could have been before the creation of Pakistan, and may relate to nuclear material that could not be taken under our charge," Zaheer Ayub Baig, information services director of Pakistan's Nuclear Regulatory Authority, said in a letter to the BBC. 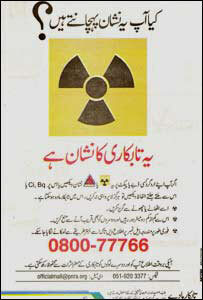 Mr Baig said that the adverts were merely a public awareness campaign to make people aware of the dangers of radiation from material that might have been used in hospitals and industrial plants. He said the advertising campaign was being expanded. "There is nothing to worry about," Mr Baig said. "We have a record of all the radioactive sources imported in to the country, those that are being used and also those that have been disposed of. "This is according to a cradle to the grave concept where records are kept of any radioactive source entering into the country until its final disposal." He said similar adverts would soon appear in Pakistan's English-language press.